Back in June I had the opportunity to spend a week birding somewhere. A friend of mine suggested trying to see Kirtland's Warblers in Michigan. I didn't know much about these birds, but after some research I was sold. I expanded the trip to include some time in Ohio too. I used eBird and Hotspotbirding.com to plan an itinerary. A friend of mine from Albuquerque now works at the Black Swamp Bird Observatory in NW Ohio, so stopping at their famous boardwalk was a no-brainer, plus I would find some other places using the Birdseye app. I would end up with 29 lifers on my trip, with 11 of them being warblers, out of 150 species seen. I'm going to mainly talk about warblers and some of my other lifers. Overcast skies and dark forest made for not so good photo opportunities, but I managed to get photos of almost everything new to me. I started off by visiting Bath Nature Preserve near Akron Ohio. This was mixed forest and field habitat with nice trails and a large pond. I didn't see too much here, but I got some good looks at maybe the most popular warbler seen, the Yellow Warbler. 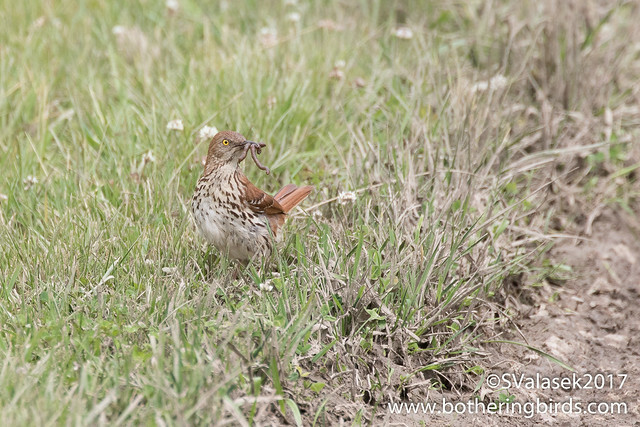 Although not a warbler or a lifer, I was excited to get good looks at a Brown Thrasher. The one that I saw in Arizona was very shy and stayed in thick brush for the most part. But I got to see a few, including this one getting a big worm for it's nest. I also saw many Tree Swallows, Song Sparrows, a Bobolink, Hermit Thrush, Red-Winged Blackbirds and a lifer Swamp Sparrow at the preserve. My second stop was near Sandusky Ohio and Cedar Point Amusement park. I had hotel reservations for the night, but had time to explore Pipe Creek Wildlife Area at the base of Cedar Point peninsula. This is a man-made wetlands designed to replace what was lost to development. It was also the start of the terrible mosquitoes that I would deal with for the next week. I arrived just as sunset and made my way out towards the water. I passed a family of Mallards. 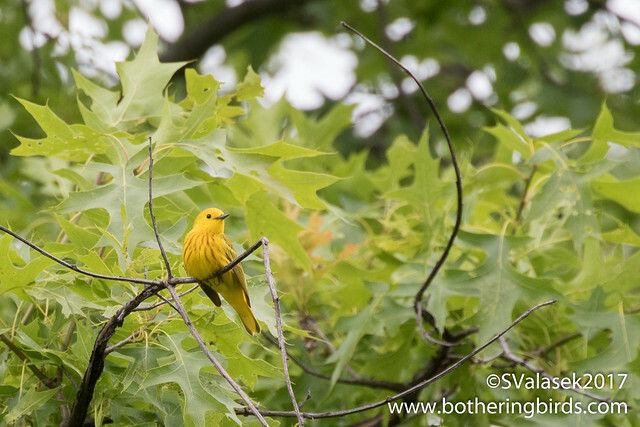 I saw even more Yellow Warblers, so many that I reported 16 but it may have been more. I saw some uncommon Black-Crowned Night-Herons and added Yellow-Bellied Flycatchers to my life list. But the most exciting bird was one that was crossing the path behind me. 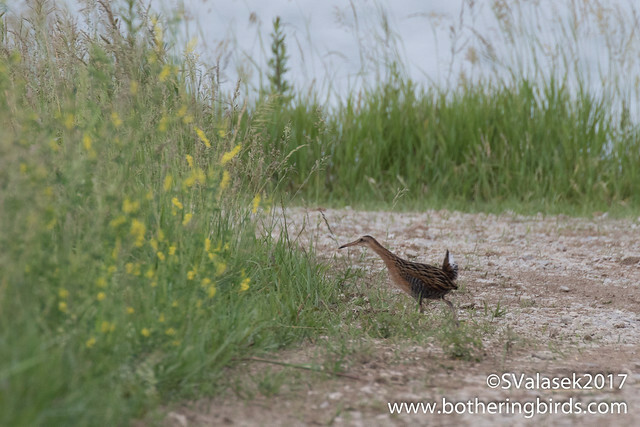 I turned around to look behind me randomly and saw a King Rail crossing the path. It stopped just before reaching thick cattails and I managed to get some photos of it. The next morning I was up early to meet my friends at Magee Marsh. I saw some surprising Mute Swans on my drive in. We were the only people at the Boardwalk, which hosted thousands of birders just 2 weeks prior to my visit. We would see many birds on our walk, and may lifers for me. 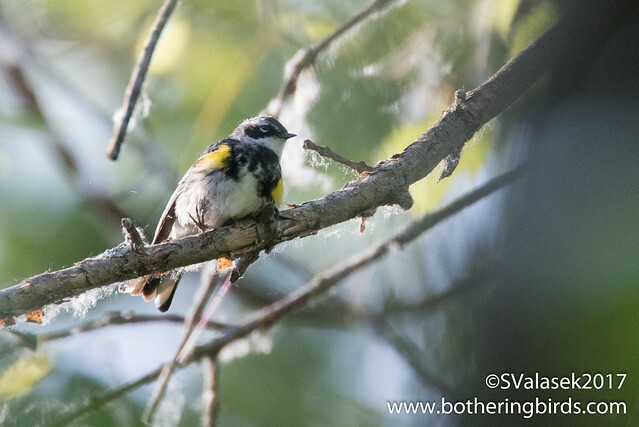 But the "rarest" bird was this late-for-the-season Yellow-Rumped Warbler. 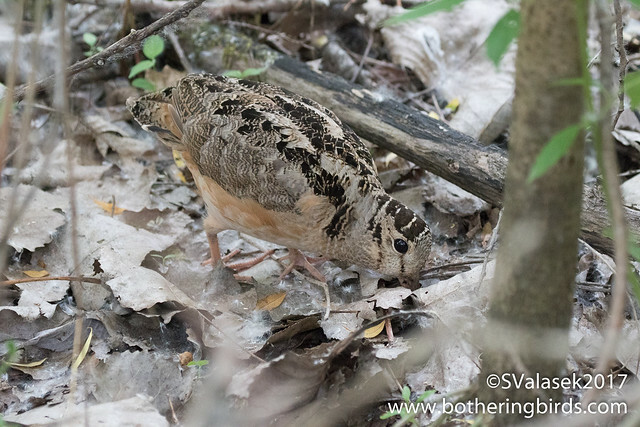 The star of the show was this American Woodcock that I spotted just off of the boardwalk. We got to watch it for such a long time once it got used to us. 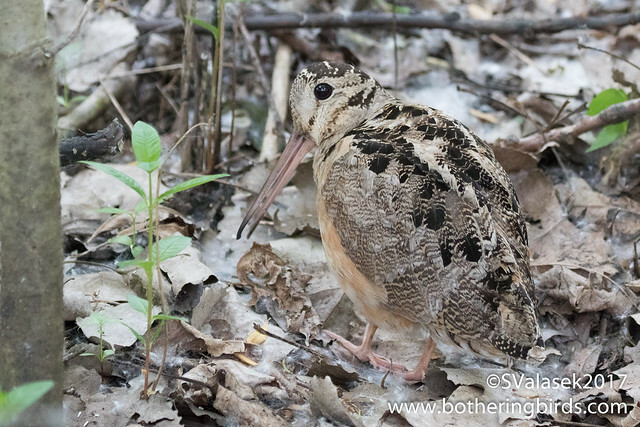 I learned that their long bills are flexible and they can use it to root around in the mud and leaf litter for food. 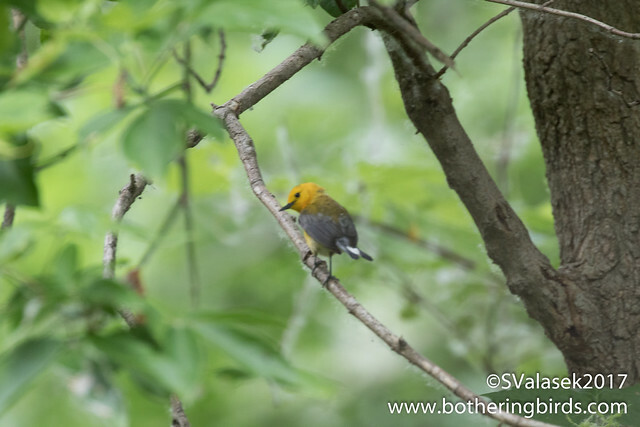 I did get to see one of the warblers that I was hoping to see, a Prothonotary Warbler, which breed in the swamp there, but it was too fast and the light wasn't good enough for anything better than this photo. 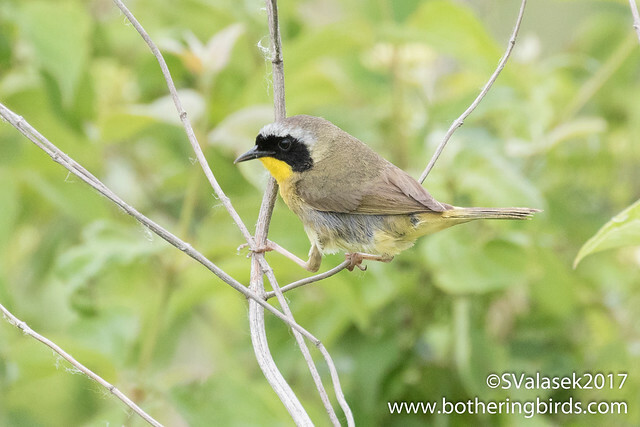 The second most common warbler on my travels was the aptly named Common Yellowthroat, which I saw at almost every stop. I saw this one on my way out of Magee Marsh on my way to Toledo. I was told about a nice place to bird outside of Toledo Ohio called Oak Openings Metropark. This was an amazing spot. The main attraction was a large open area in the forest caused by a Tornado many years ago. This made for a varied habitat of older forests and a younger open area in the center. It wasn't very good for warblers, but I got to see some great birds. 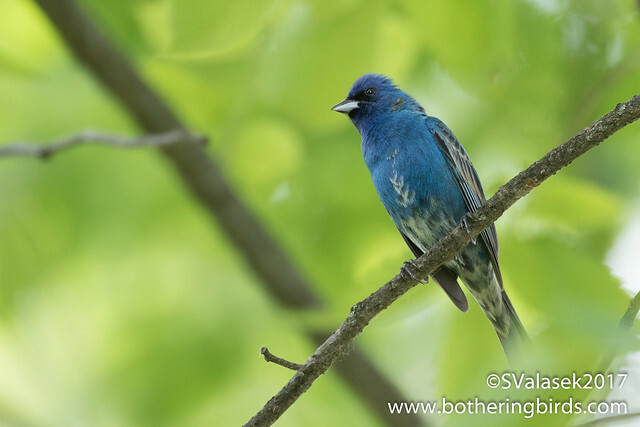 This Indigo Bunting let me get fairly close. 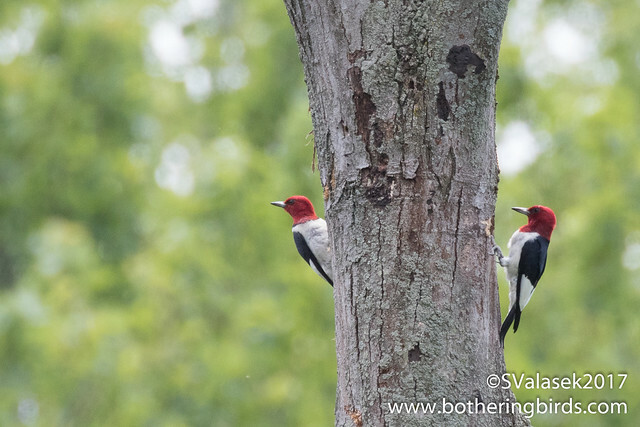 And it was a pleasure to see a few Red-Headed Woodpeckers, these two were inspecting nest holes, I believe. One of the lifers that I did get here was Field Sparrow, in the middle of the tornado scar. 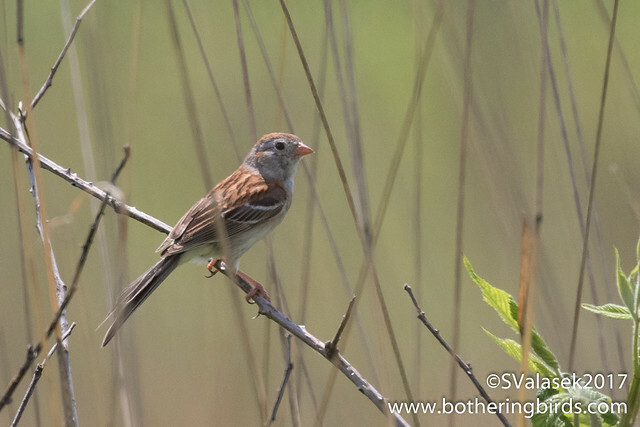 Field Sparrow - Lucas County, Ohio USA. After Toledo I traveled north in Michigan. I'll cover this part in my next blog post since I was able to see some great birds up there.